Reading Kids Are Dreaming Kids | A blog about children’s book that inspire children (and their parents)! Trisha loves the eight days of Hanukkah, when her mother stays home from work, her Babushka makes delicious potato latkes, and her Grampa carves wonderful animals out of wood as gifts for Trisha and her brother. In the middle of her family’s preparation for the festival of lights, Trisha visits her closest neighbors, expecting to find them decorating their house for Christmas. Instead they are all bedridden with scarlet fever. Trisha’s family is one of the few who has been spared from the epidemic. It is difficult for them to enjoy their Hanukkah feast when they know that their neighbors won’t be able to celebrate their holiday. Then Grampa has an inspiration: they will cut down trees, decorate them, and secretly deliver them to the neighbors, “But what can we decorate them with?” Babushka asks. Although it is a sacrifice, Trisha realizes that Grampa’s carved animals are the perfect answer. Soon her living room is filled with trees — but that is only the first miracle of many during an incredible holiday season. What I really like about this book is that it is absent the longing of Christmas and really features two people living side by side, practicing their own religions, and helping each other when they need it. A child’s vision of religious tolerance is exquisitely played out in this story about an elderly Christian barber and a Jewish child who befriends him. As a hobby, the African American barber makes elaborate woodcarvings–many of which refer to events or characters in the Bible. Michael, a 9-year-old Jewish boy, often visits the barbershop just to admire old Elijah’s carvings, especially that of Noah’s Ark–a story that belongs to Jewish as well as Christian teachings. One day when Hanukkah and Christmas coincidentally overlap, Elijah gives Michael a special gift, a carved guardian angel. Immediately Michael is filled with a jumble of feelings–gratitude for such a beautiful gift, concern that his parents might disapprove, and an even greater fear that God may frown upon a Christmas angel, “a graven image,” in Michael’s home. The thick sweeps of paint, the heavy uses of wood-tones, and primitive images make the settings and characters look as though Elijah carved them himself. When Michael finally reveals the carved angel to his parents, they help the young boy understand how expressions of friendship, love, and protection can be carried into any home, regardless of the household’s religion. Again, lovely story about friendship and people being happy with who they are. Based on a true incident that occurred in Billings, Montana, this story begins when a rock is thrown through a boy’s bedroom window in which a menorah is displayed. The boy, Isaac, is frightened and unsure whether he wants to put the menorah back. His parents call the police, and his mother goes on television and to a meeting to talk about hate crimes in the community. Inspired by stories of the Danish people helping their Jewish neighbors during World War II, the people of Billings put menorahs in their windows to take a stand against bigotry. When a schoolmate supports Isaac, he takes his own stand by returning the menorah to its place. Although the plot seems a little stilted at times, Cohn deals with the issues in a way children can readily understand. Polacco is a master at intergenerational, interfaith stories that bring comfort and joy, and this one based on homilies she had heard widely separated in time and place is no exception. Jonathan must adjust when his preacher father moves the family to Detroit. After lots of work, the church is almost ready for Christmas, but then ice damage gouges a hole in a church wall. Father and son find a beautifully embroidered hanging and buy it with the last of their money; as they wait in the snow for the bus, an old woman offers them tea from her thermos. When they finally get to the parsonage, she is astonished to find the tapestry is one she had made as a chuppah for her wedding in Germany, before she was separated from her new husband who was lost in the war. The plasterer, who comes to fix the hole, also recognizes the hanging, and delighted audiences will soon figure out his identity. Christian and Jewish holiday celebrations intermingle with the message that nothing in the universe is random. The tender colors and gestures in the illustrations echo the text to make a satisfying whole. The story is beautiful and touching and likely missed by many Jews because of the overt Christmas message of the description. It’s really quite incredible. Last thought: Lisa Silverman, a fantastic Jewish librarian and connoisseur of Jewish children’s book writes about A Chanukkah Noel and a new book (that I haven’t seen so didn’t include in this round up because I haven’t read it) called Jackie’s Gift: A True Story of Christmas, Hanukkah, and Jackie Robinson, written by Jackie’s daughter, Sharon Robinson. While I disagree with her Hanukkah book suggestions, I think the article itself is great. Remember Encyclopedia Brown? I loved the series as a kid, and I have to say that I even love it now as an adult. I remember trying desperately to figure out the mysteries, and never being able to do it. One great thing about getting older is that finally as an adult, I can now figure them out! Now as I listen to them, I hear the out-of-place detail, I can figure out the type of clue that Encyclopedia looks for. I don’t need to describe the series by Daniel J. Sobel because I’m sure you know them well. They’ve aged pretty well — I think I’m the only one who notices how many mysteries depend on not having had a cell phone or the fact that there’s no internet… There’s a little colorful ethnic stereotyping going on, so you just need to watch out for that. My seven-year old has been reading my old copies, and then we’ve been listening to the stories in the car. Just good clean stories — the kind that still makes me smile. 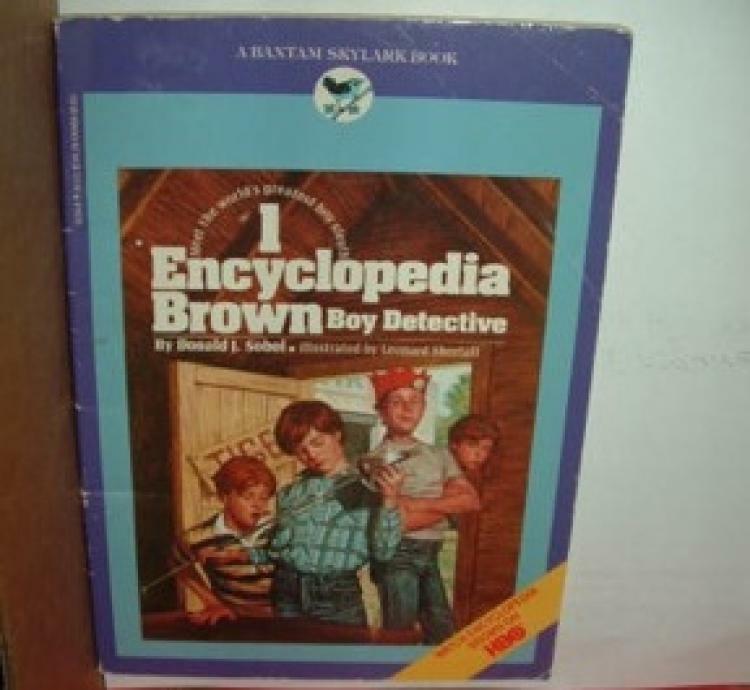 Do you remember any Encyclopedia Brown mysteries from when you were a kid? I can’t believe I hadn’t blogged about this before (OK, so it’s probably because it’s been a little while since I last blogged). This Totally Bites by Ruth Ames ROCKS. Emma-Rose Paley is a fantastic heroine who looks a little more vampire-ish than the rest of her family. Which wouldn’t be a big deal if it weren’t for the fact that her great-Aunt Margo is coming for a visit from Romania and looks a lot like Emma-Rose. And for the fact that Great-Aunt Margo is clearly up to something other-worldly. Could it be that Emma-Rose’s aversion to garlic and sunshine are more than just a question of taste? Clearly, This Totally Bites is playing off the current vampire craze, setting this story up for the 8-12 crowd who are a little young for Twilight. But it’s way more than that. The storytelling here is way beyond what you get in most young chapter books — it really moves and the plot builds and the characters are remarkably developed. I’ve given this to a few reluctant readers who plowed through it and demanded more! What I really like about the story though is the ending, which I won’t give away. I expected that she couldn’t be a vampire. Or maybe Ames would make her a vampire? But the ending is much more inventive than I could have predicted.